After winning its fourth straight ACC championship, Clemson is now heading to its fourth straight College Football Playoff appearance. While the Tigers have continually claimed their spot in the playoff over the past few seasons, their opponent Notre Dame is making its first appearance in the new playoff era. Clemson and Notre Dame will be participating in the first game against each other since 2015, where the Tigers pulled out a nail-biter in some of the worst conditions we’ve seen at Death Valley. While Clemson rather comfortably found its way to the playoff, with their closest games coming early in the season against Texas A&M and Syracuse, the Fighting Irish are undoubtedly the toughest test Clemson has had this season. Notre Dame’s defense is stellar to say the least, ranked 4th in S&P+ while their offense is ranked a respectable 26th in S&P+. Overall, the team is ranked 6th in S&P+ amongst all FBS teams. Based off of strength of schedule, although Clemson has statistically a harder schedule (14th), Notre Dame’s schedule (26th) was no cake walk. After pulling out an early tough win against at the time No. 14 Michigan, Notre Dame had a couple of close calls against some unimpressive teams. In the team’s first three games with former starting quarterback Brandon Wimbush, the Fighting Irish failed to score over 24 points in all three of the games and won by just one score in each of the three games. These three early wins came against a prior mentioned Michigan (5th), but two weaker opponents’ in Ball State (117th) and Vanderbilt (68th). 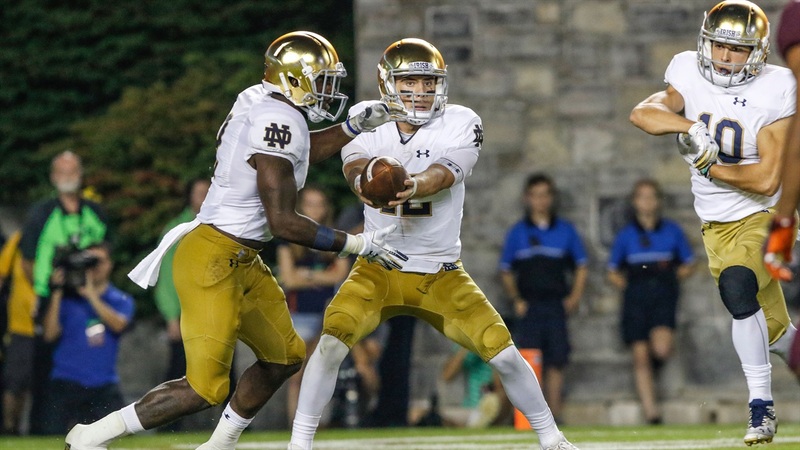 However, in Week 4, Notre Dame changed its quarterback, going with Ian Book over Wimbush. With Book now under center, Notre Dame has been firing on all cylinders. In their nine games with Book starting at quarterback, the Fighting Irish have beaten just two S&P+ top-50 teams in USC (39th) and Syracuse (43rd). While Michigan (5th) is the highest ranked team they played during the regular season, Clemson (2nd) will surely be the toughest test they face all season. While Book has completely reshaped the Notre Dame offense, his supporting cast of top Fighting Irish recruits are no group to take lightly. With a great running game and a crop of solid receivers, Notre Dame’s offense isn’t necessarily one of the best in the country but it certainly is impressive. Since taking over the offense, Book is ranked 8th in QBR while completing 70.4 percent if his passes, ranking 4th in the country. Book’s 8.8 yards per completion also ranks 8th in the country among quarterbacks. While he may not be the most dangerous player on the ground, Book did rush for 250 yards and four touchdowns on the season. After being a backup for the majority of his career, running back Dexter Williams has stepped into the spotlight in the Notre Dame offense. With just 142 carries, the star back has run for 941 yards and 12 touchdowns, while averaging 6.6 yards per carry. While the Notre Dame receiving corp may not be as deep as Clemson’s, Book has had a couple of big receivers to throw the ball to this season. Senior wideout Miles Boykin leads the Notre Dame aerial attack throughout the year, leading the team in receptions, receiving yards and receiving touchdowns. Standing at 6-foot-4, 228 pounds, Boykin’s big frame has made him the Fighting Irish’s most dangerous target. On the other side of the field, receiver Chase Claypool (6-4, 227) is another big target for Notre Dame, ranking 2nd in all receiving categories for the Fighting Irish. Along with slot receiver Chris Finke, the three top receiving targets for Notre Dame have combined for over 59 percent of the team’s receptions. Far and beyond the team’s strongest link, the Notre Dame defense is the biggest test of the year for the Clemson offense. Led by interior linebacker Te’von Coney, the Notre Dame defense is solid across the board. While Coney leads the team in tackles (107), cornerbacks Julian Love and Troy Pride Jr. have been one of the best cornerback combinations in the NCAA this season. Combing for six interceptions and 24 pass deflections, the two have helped lead the Fighting Irish to a passing S&P+ ranking of 6th in the country. Like Clemson, Notre Dame boasts one of the best defensive line rotations in the country, led by defensive tackle Jerry Tillery’s (6-7, 305) seven sacks on the season. Khalid Kareem (5.5 sacks), Julian Okwara (5.5 sacks) and Daelin Hayes (3.5 sacks) have also been active members on the defensive line. While their pass defense is stellar to say the least, their run defense is impressive as well ranking 18th in rushing S&P+ on the season. Although the Fighting Irish are solid all around, the one point where the team may be weakest is in the offensive line, particularly in the run. While running back Dexter Williams has enjoyed a breakout year and Notre Dame has traditionally been a running team, the ground game hasn’t been as effective this year. On the season, the Fighting Irish run game has been towards the middle of the pack in nearly every rushing category, including being ranked 49th in rushing yards per game and 58th in rushing yards per carry. Notre Dame’s troubles on the ground include performances such as their game against Pittsburgh where they totaled just 80 yards running the ball. While the explosiveness of Williams may be enough for the Fighting Irish to overcome what they’ve been lacking on the ground most of the year, it will be exciting to see how the Notre Dame offense comes out and plays against Clemson No. 1 ranked S&P+ rushing defense.